I've come across an event via Rainfield's My Journey called Flowers for Leontien. I picked an orange flower because I learned that it is one of the healing colors. I've only known Leontien through this event but I am sincerely wishing her well. Coincidentally, orange is also associated with being thoughtful and sincere. You are in my thoughts and prayers, Leontien. Please know that there is someone up there known as the HEALER. I commend Nancy of A Rural Journal for creating this event. You are sweet and lovely. Gorgeous thought and great information. I had no idea orange was a healing color. thanks for this post Che, I will try to make a post for Leon Tien too. and this is a beautiful shot. Bless your heart -- Beautiful. Touching sentiments with such a beautiful image. Thank you for sharing with Photo Art Friday. Beautiful photo and a very thoughtful gesture for Leontien. They are so commonly found here and so beautifully photographed by you. Beautiful flower, the Orange just pops against the dark background. Fabulous colour and I love the idea of creating a virtual bouquet of flowers. beautiful picture. love the contrast between the flower and the black background! 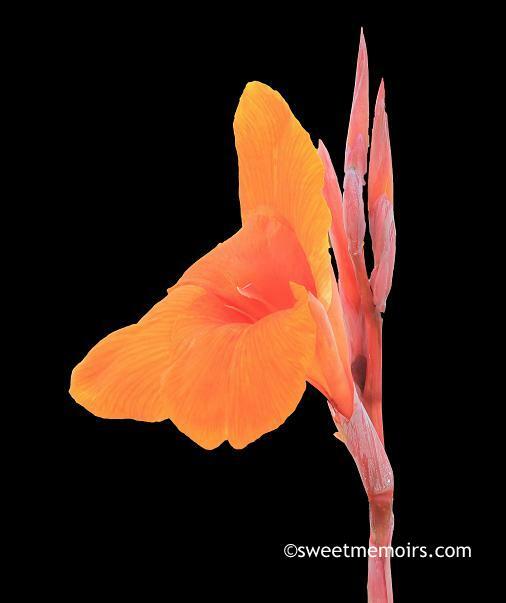 Stunning shot of the orange canna.